Tropical Studio is a very cozy apartment on the ground floor of an Andalusian country house, surrounded by 3.000 sqm of biologically certified land and a lush tropical garden with many orange, ancient olive, avocado and other southern fruit trees, a playground and a large child proof pool with wide green lawns, all this settled in the middle of pure and calm nature. The shared saline-swimming pool produces a natural alternative to chlorine; it is 9 x 4m and incorporates a shallow toddler section. The Studio is recently renovated and is characterized by its refined Andalusian style, its traditional tile floor and bright spaces. The property is only 1km away from Orgiva (2 min driving and 10 min walking to town), providing high standard within the quietness and tranquility of pure nature. It is a privileged spot to experience holidays as pleasant and relaxing as possible and explore the heart of the genius Andalucía. There is a curtain which could separate the bedroom/desk area and the living room. The windows give great views of the garden and the private terrace. The bathroom as well as the kitchen area is totally new and fully equipped. Everything is tastefully decorated and the studio contains all you could need in details as, for example: sharp kitchen knives, large red wine glasses, quality mattresses and bed linens, north European standard duvets, all types of towels, French relax-loungers, good outdoor furniture, etc. We live in the other part of the main house and I will make sure that peace and privacy of our guests is fully respected. The upper part of the house, a penthouse, is also for rent from May to September. The property also houses another holiday villa on the other end of the land, which is also for rent. The pool area is shared by all houses within the property. All houses do have their own garden, terraces and barbecue area. On request, you can also book a hot Finnish wood-fired sauna in our property. These prices are for using the entire estate (apartment, garden and pool) for up to 2 adults. Any extra bedding is charged 10€ per day. But extra bedding for children fewer than 12 is free. Beds ready made with complete clean linen set of quality bedding, bed rugs, towels (hand/facial, bathing, pool/beach), kitchen cloths, sponges, set soap and toilet paper, candles and matches and a welcome gift of sugar, coffee, tea, cocoa/hot chocolate, spaghetti, canned tomato, a bottle of organic wine, a bottle of our own homemade organic olive oil, a fresh fruit bowl and a bottle of mineral water. Check in is from 2pm onwards, check out before 12am or according to arrangement. I came across the Alpujarras by chance during my journey through Spain in the mid 80's. This was about the same time as the famous book writer Chris Stewart arrived into the area. Years later he published his bestseller ‘Driving Over Lemons: An Optimist in Andalucia (The Lemons Trilogy)’ where he tells all these funny tales and amazing experiences he had in this very region. I also discovered the same sort of authentic unspoiled paradise as he did. Back then, south of Granada was very different to what it is now. The area was impoverished, there were not many cars around but lots of donkeys instead, TV was a novelty and people actually 'lived' in the bars. There was no VAT tax yet and no motorway for hundreds of miles. Granada was a day journey away and northern Europe a different planet. I was in heaven. I’ve been living in this area for almost 30 years and my children were born and grew up here. I absolutely love this region. Since then, I've been exploring the many things this area has to offer: hiking, skiing, cycling, snorkeling, biking, cooking, climbing and partying, of course. It´s my home and it feels like paradise! The Studio is very well prepared, fully equipped and comes with all inclusive. Once you are here everything will suit your requirements and you will be enjoying a relaxing holiday right from the first moment. In the area there are many things to do and to explore and it would be a pleasure for us to offer all the experience we have gathered in the 30 years we have lived here. We can give you practical tips and advice about all the activities you can enjoy in the region. In the house you will find a detailed information brochure including road, street and hiking maps and helpful suggestions and descriptions about walks, hikes, nice car rides, beaches, restaurants, shopping, cultural events, ticket bookings, etc. If you might already have some questions. You will find most information on the Hospitality App of HomeAway on your mobile. If you have any specific questions regarding your stay or any other detail, please don't hesitate to contact us by this web-site. 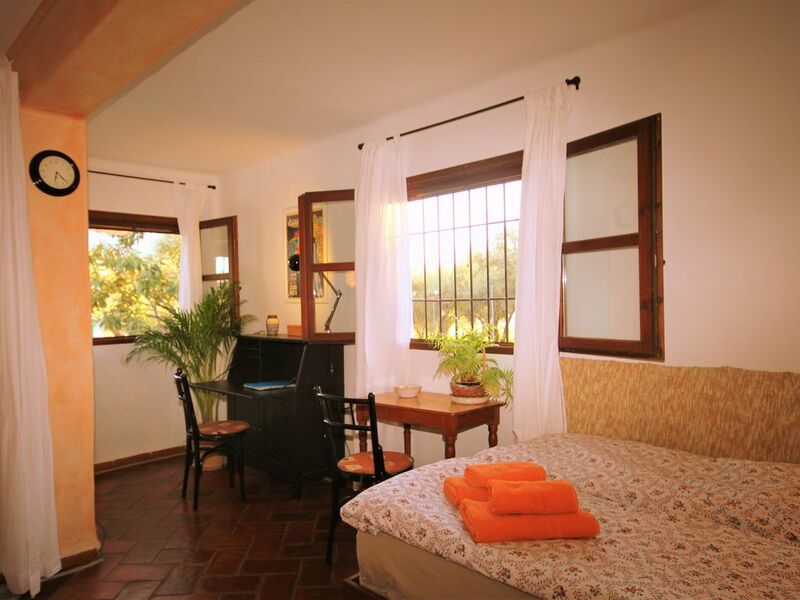 We really want to offer you the opportunity to immerse yourself in the authentic Andalusia. In den letzten 1,5 Jahren war ich drei Mal bei Oli und Maria. Ich bin jedes Mal überwältigt von der Atmosphäre ,der Gastfreundschaft. Die Unterkünfte sind unglaublich sauber,sehrbgeschmackvoll renoviert und liebevoll vorbereitet. Ich fühle mich zwischenzeitlich wie zu Hause. Alle Fragen werden beantwortet,dennoch ist die Betreuung sehr diskret.Ich kann das Studio unbedingt empfehlen,gerade wenn man mal alleine reist.Dieser Platz macht süchtig.Die Wandermöglichkeitenb(auch Anschluss zu örtlichen Wandergruppen )sind vielfältig.Empfehlenswert istbdie Massage von Maria.Sobald ich kann komme ich wieder.Vielen Dank liebe Gastgeber.Bleibt wie ihr seid. Very sweet studio, comfortable bed, very clean and cozy. Oliver and Maria are wonderful hosts. Great views of Orgiva and the mountains around. Every morning we picked oranges directly from the trees outside our door, orange juice will never taste the same! While making an overnight escape to Cordoba we forgot to take our passports and could not get into our hotel. Oliver saved the trip by copying and e-mailing a copy of the passports to the hotel, Oliver went way above and beyond his duty as a host. We'll remember our stay with fond memories. Beatrice y Robert, muchas gracias por vuestras palabras. Habéis sido unos huéspedes que siempre recordaremos con cariño, por vuestra simpatía, maravillosa conversación y buen humor. Nos encanta que os haya gustado Orgiva y que hayáis disfrutado de la vida en la casa y en el pueblo, porque es justo lo que queremos transmitir a nuestros huéspedes: que este lugar es muy especial! Esperamos volver a encontrarnos en el camino! The property is settled in a wide and green terraced land of 3.300sqm with lush garden, surrounded by pure and calm nature and the impressive wild landscapes of Sierra Nevada but just 1km away above the town Órgiva. The closest town, Órgiva, is a very lively, southern Andalusian market-town, picturesquely situated in a large valley in the middle of a wild mountain landscape. Surrounded by rivers, olive and orange groves, it is not a tourist spot, rather a normal village which offers numerous street cafes, bars, restaurants, small shops, a weekly market, an old covert market with fish stalls but also small supermarkets, organic shops, banks, a post office and an emergency hospital.